The AccuFlo® is the most powerful, precise, and efficient blaster in our MicroBlaster® line. It is such a design breakthrough that we had to give it a new name and its own page. This improvement on our classic and popular MicroBlaster incorporates the advanced features of our robust units, like the PowerFlo®, and exceeds the reliability and performance of its predecessors. 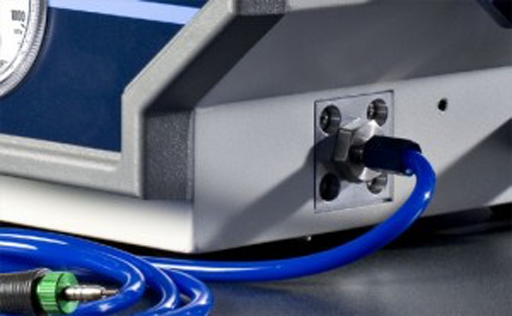 The AccuFlo suits most applications and is in use across industries—from small, independent labs to large multi-national manufacturers. It easily transitions from use in single-operator processes to fully automated production environments. The AccuFlo’s ideal partner—the ProCenter Plus™—combines a powerful dust collector, a chair-height work chamber, and an air dryer into one compact, freestanding, and mobile unit. Together they form a turnkey system that suits most manual MicroBlasting applications. 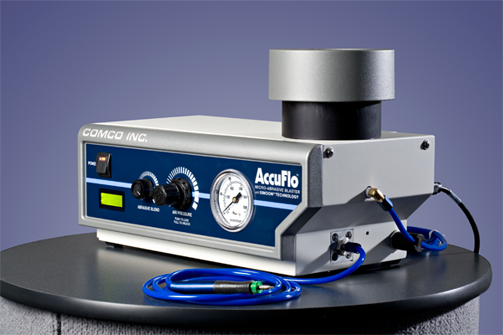 The AccuFlo easily grows with your output. It is designed to integrate seamlessly from manual system to automated system. 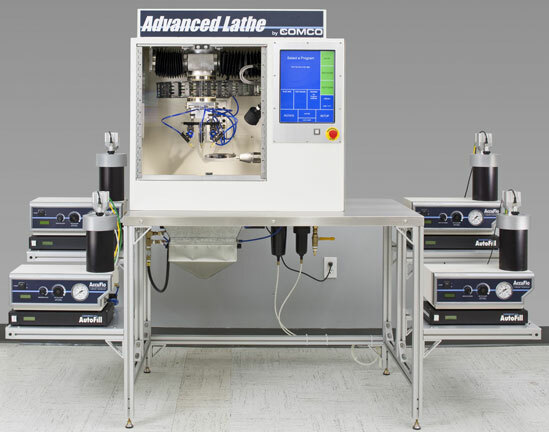 This blaster delivers the same precision and control in automated systems, resists wear exceptionally well, and accommodates the AutoFill option. One of our newest technological advances is AutoFill. 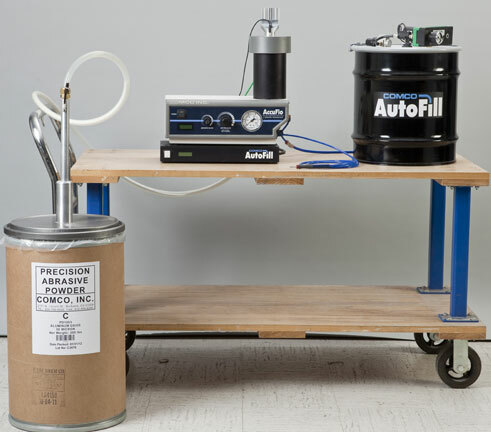 When combined with the Tall Tank model AccuFlo, AutoFill is the perfect solution for your automated set-up. AutoFill actively monitors the level of media in your AccuFlo tank and refills so you don’t have to. The top and back panels are completely removable for easy access to the color-coded components. The easy-to-read LCD display tracks blast cycles and hours, providing clear milestones for maintenance. The media tank features a transparent cover, abrasive resistant threads, and holds 50% more abrasive than the MicroBlaster. 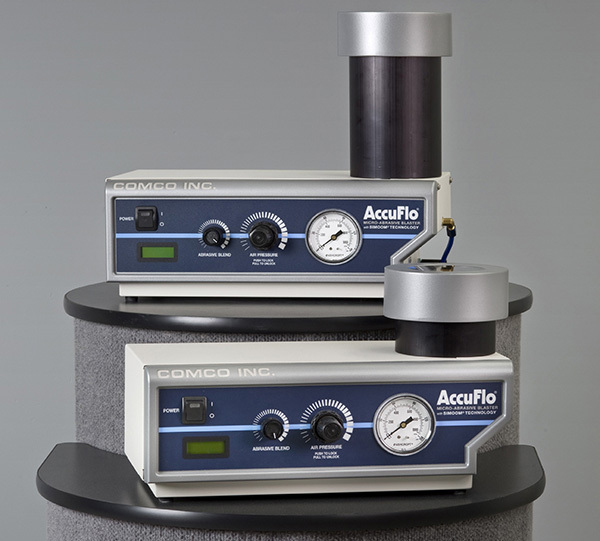 The AccuFlo is available in a variety of configurations, including a selection of models, adaptations, nozzles and abrasive. Our Technical Sales team will work with you to ensure that your system is configured exactly the way you need it. Long hours blasting do not have to be hard on your hands! AccuFlo nozzles have the same internal geometry as Hi/Performance nozzles with the added bonus of a well-designed holder: the ComfortGrip Handpiece. This stylus provides the ultimate in comfort and performance. It has a cushioned grip with a natural feel, and it is less resistant to motion than most handpieces. Simply, the ComfortGrip Handpiece enhances control and reduces fatigue. It is also easier to fixture. It does not require a nosepiece, as the hose connects the nozzle directly into the two-piece ComfortGrip. 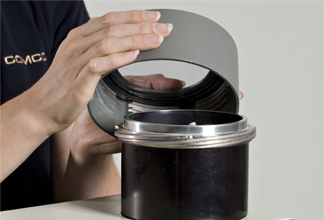 That means fewer parts come into contact with abrasive, which in turn means less need for parts-replacement. 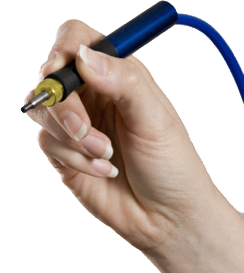 The ComfortGrip Handpiece is compatible with most popular nozzles sizes (0.018″, 0.030″, 0.046″, 0.060″ ID). Originally released as part of our PowerFlo® and DirectFlo™ line, the PowderGate valve replaced the traditional pinch-valve that simply crushed a soft abrasive hose. The PowderGate proved to be tremendously wear-resistant and functional in harsh environments. 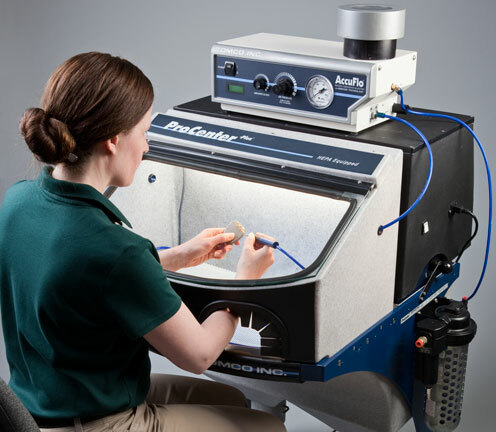 So, we redesigned it to work in our AccuFlo micro-abrasive blaster, too. This scaled-down version of the valve fits neatly in the abrasive mixing chamber on the tank, features a straighter flow path, and sits in an easily-accessible spot on the side of the system. Our PowderGate valve is rated to last about 250,000 blast cycles in a production environment without maintenance. The traditional pinch on the MicroBlaster lasts about 10,000 blast cycles. During the early stages of the AccuFlo’s development, we prioritized creating a media mixing technology that was superior to the modulated feed used in our older MicroBlasters. We found that while the modulator itself was a great way to fluidize very fine abrasives, more could be done to intensify the pulsing mechanics of the system to create a more streamlined flow path and reduce turbulence. Simoom® Technology, our patented method of consistently and efficiently mixing air and abrasive, is the result of several years of research and development. 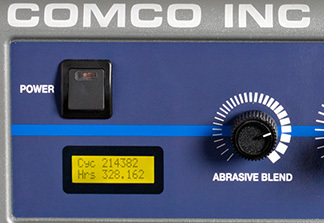 It provides better control over the abrasive stream than most other blasters and allows the AccuFlo to flow a wider range of abrasive. Our engineers focused on avoiding turbulence at all costs, especially when introducing abrasive into the air stream. Bends and complex shapes focus the abrasive force, which causes rapid wear and tear within the system. We believe that particle acceleration should only happen at the nozzle. Any change in the diameter of the hose or passageway through the machine causes a change in abrasive particle velocity. Particles traveling at higher velocities wear out the inside of the machine faster. Changes in diameter of the internal passageways also cause more friction within the blaster. Any increase in friction reduces the amount of pressure available at the nozzle for particle acceleration. Machine wear is inevitable in an abrasive environment. Eventually any component that comes in contact with the abrasive media requires replacement. The AccuFlo was designed so that essential components exposed to abrasive are accessible and do not require an engineering PhD to replace. The modulator can be replaced by removing two screws that attach the cover. The mixing chamber is accessible from the outside of the unit with an adjustable wrench. Cycle and hour counters help set routine maintenance cycles for those wear parts. 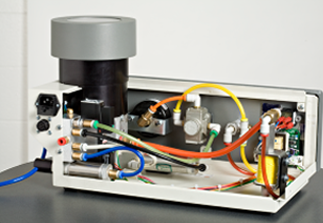 All AccuFlo models are designed to be CE and RoHS compliant.